As official figures further undermine the government’s credibility on the right to buy there are new doubts about the feasibility of the plan to extend it. If ministers are to meet their pledge of one for one replacement of all homes sold, starts on site should now be rising sharply as receipts from earlier sales feed through the system. Any guesses what’s happening instead? That’s right, the latest quarterly stats from the DCLG show that just 307 replacements were started between April and June – down 17 per cent on a year ago. The significance of this is not just the year-on-year fall itself, the first since the government ‘reinvigorated’ the right to buy with increased discounts and the replacement pledge in April 2012. Nor even that starts are down 56 per cent on the previous quarter (the end of the financial year). It’s also that this quarter marks three years since the start of the new scheme: the small print of the pledge says that replacements will be built within three years for all additional homes sold on top of those already forecast. That in turn raises severe doubts about the government’s claim that it can fund the extension of the right to buy through the forced sale of high-value council homes. It claims this will raise enough to pay for the discounts, pay off the historic debt, replace all homes sold one for one and set up a brownfield fund. The detail has not yet been published but the plan has led to alarm even among Conservatives about the impact in London. Research by Shelter forecasts that local authorities could have to sell 113,000 homes and that the council stock could be virtually wiped out in some areas. With Kensington and Chelsea topping the table (potentially losing 97% of its stock), it says 79,000 of those sales could be in just 20 local authorities. Most are in or just outside London but they also include Leeds, Cambridge, Warwick, Solihull, Newcastle and York. Between them they have 159,000 families on the waiting list, 12,000 who are homeless, 47,000 living in insanitary or overcrowded conditions and 12,000 who need to move on medical or welfare grounds such as having a disability. Back with the current stats, the overall record now reads 3,644 replacements for 32,288 homes sold under the reinvigorated right to buy: one for every nine sold. Sales were down 2 per cent on a year ago in the latest quarter, the second successive slight quarterly fall, so the bigger fall in starts means that the overall replacement rate also slipped back. The government will point to the three-year time lag between receipt and start on site in its defence. But that starts to crumble when you look at the stats: the 307 starts in the last quarter compares with 442 sales three years ago in April to June 2012. Another problem is that we still don’t really know how accurate the replacement figures are. The DCLG admitted in February that it had massively over-estimated them because some councils were wrongly including homes funded by the HCA and GLA. But even the revised numbers come with health warnings. The current figures include all starts on site and acquisitions of homes made by or on behalf of the local authority excluding those funded by HCA/GLA. And the DCLG admits this may include some may be funded by other sources and that councils’ interpretation of what constitutes a start ‘may still not be uniform’. A quick look at the figures at local level makes this point clearly. Thanks to increased discounts, London local authorities have sold 9,225 homes since April 2012. That’s 29 per cent of total sales (and 35 per cent in the latest quarter). But there have only been 689 starts on site in the capital: one new home for every 13 sold. Within that, Barking and Dagenham has apparently managed 506 replacements for 575 sales whereas Greenwich has built 0 replacements for 682 homes sold. Away from London, the District Councils Network raised more problems in a meeting with communities secretary Greg Clark this week. They told him their members had only managed to replace one in eight homes sold and warned that other policy changes including the social rent cut had already stalled construction of 3,500 homes. So the government’s credibility on replacements looks shot to pieces even before we come to the extension of the right to buy to housing associations. It has yet to find a way round the problem that funding it by selling expensive council homes will mean a massive transfer of money from areas that have council housing (especially London) to areas that only have housing associations. And how many councils will want to build if they could instantly be forced to sell them again and hand over the proceeds to the Treasury? The government has not yet published the details of a policy that the Conservatives made a centrepiece of their manifesto. As I blogged at the time, there were good reasons to think it might not stack up – and the Institute for Fiscal Studies argued the same thing a few days later. No doubt work continues feverishly at the DCLG and Treasury ahead of the spending review to make the policy work. However, Shelter says its analysis suggests that the plan is so fundamentally flawed that the government needs to scrap it completely. It based its analysis on published regional thresholds that the Conservative manifesto estimated would raise £4.5 billion a year from 15,000 sales. But it says this significantly over-estimated the number of council homes that are in their top third most valuable in their area. 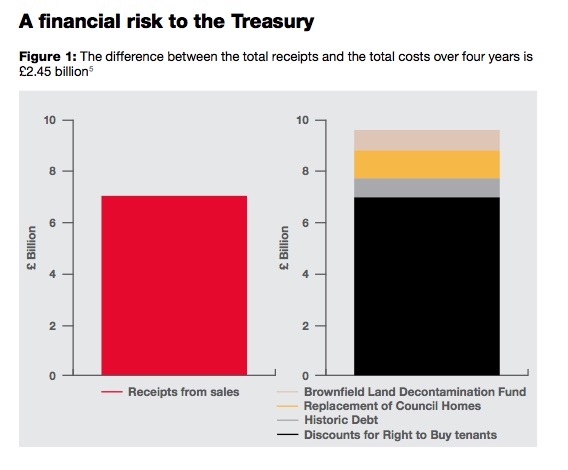 As a result, the scheme will not generate enough receipts to pay for the promises to fund right to buy discounts for housing association tenants, replace the council homes sold, pay off the historic debt and set up a brownfield land decontamination fund. Shelter puts the cost of these four policies at £9.65 billion over four years while council house sales raise just £7.2 billion. The gap is a cool £2.45 billion as sales only raise enough to pay for discounts. It’s easy to laugh at the increasingly convoluted ways in which ministers claim they are meeting the one for one replacement pledge. Or at least it would be if the implications were not so serious for people who desperately need a home. But as the government prepares to extend the right to buy could the joke be on the Treasury?